Renewal by Andersen is looking for top sales professionals to add to our highly successful sales force. We are a leader in the window industry and we are looking for the best to join and grow with our organization due to continued growth! Our St. Louis branch has been awarded the prestigious Better Business Bureau Torch Award. The award recognizes companies and charities that are committed to exceptional st andards for ethical business practices and service to their customers, employees, suppliers, and communities. Our sales force is made up of top performers that are highly compensated and can earn $100,000 plus and beyond by selling the most recognized and industry leading br and on the market. Are you a salesperson that is motivated, can build trust, and establish rapport with a customer easily? Are you a great br and ambassador able to identify the customer’s needs to a superior product? We are looking for Sales Reps to visit our customers, in their homes, to consult with them and help them identify the product that will fit the needs in their home. 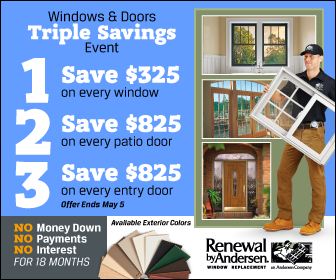 Renewal by Andersen is the leader in terms of quality, value and service! Using the tools, training and sale methodology that you will receive in training, you will create a connection with the customers to offer our replacement services. You will have industry leading product samples, support and technology to assist you in closing the sale. The leads that you will receive are 100% lead generated for you! There is NO COLD CALLING! We have an incredible marketing engine that works to take care of all of the leads for our In-Home Sales Rep through traditional and non-traditional forms of marketing. We offer six weeks of paid training to prepare you for success to be out in the field selling! It does not end there. Our organization is committed to your success. We have ongoing sales training and Sales Managers in branch locations ready to help develop and grow our Sales Reps in their talents to succeed. Our organization culture is positive and we encourage collaboration, growth and innovation. A proven track record of closing sales. A strong focus on exceeding customer expectations. Schedule availability to run homeowner appointments on many evenings and weekends. Time and work process management skills with the ability to work independently. Ability to pass a comprehensive background. If you are have the necessary experience and are looking for a great career, place to learn, and grow we would like to hear from you!